Hey there! (That's a Catherine Pooler tagline!) 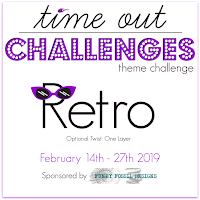 The Time Out challenge this time is sponsored by Catherine Pooler Designs (hence the "hey there! "), and the challenge is to be unique. I was a little stumped at first, so I did what everyone usually does and went to Pinterest. I found some interesting prints of black silhouettes against book print. Score! I purchased a dictionary at a dollar store years ago and pulled it out. I tore out a page and adhered it to a piece of cardstock to make it more stable. Then I die cut it with a stitched rectangle and stamped the images and sentiment in Versafine onyx black ink for that silhouette look. I masked the flower to stamp the leaves, however I don't think I really needed to because it was all stamped in the black ink. I added this piece onto a black mat that was also die cut with a larger stitched rectangle. The base is a cream cardstock because white was too bright. I added some crystals on the flowers and around the piece. I think stamping on a dictionary page is pretty unique! 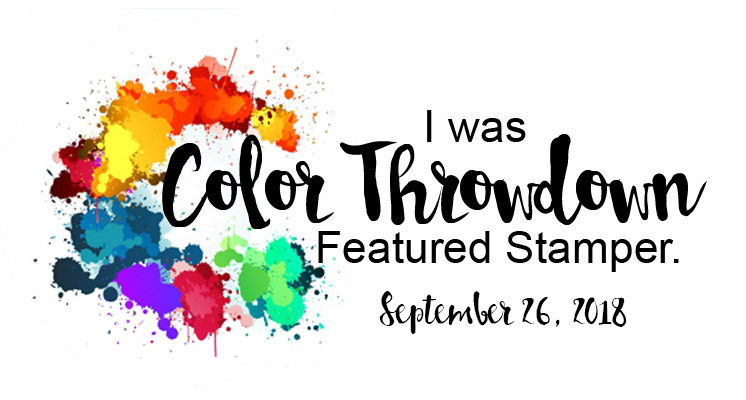 You can see more from the Time Out design team and our guest for this challenge, Elizabeth, on the Time Out blog. Hi everyone! 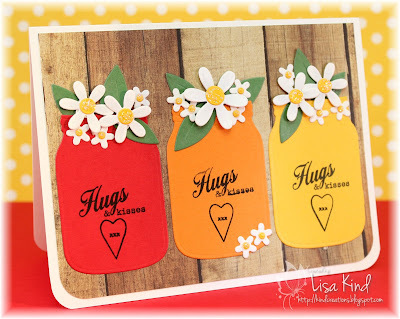 Have you seen the new Magic Picture Changer dies from Lawn Fawn? I'm in awe of them! I just got these in the mail yesterday and had to create a card(s). I did two and will post the other one tomorrow. First of all, I'll tell you the story behind the reason for making this card. My best friend Maria had to put her beloved Australian shepherd Roscoe down on Friday. It was very sudden. They found his sudden discomfort was due to a bleeding tumor on his spleen. So sad. He was such a good dog and only 10 years old. We all loved him (especially my hubby who would watch him when Maria and her hubby needed a sitter). 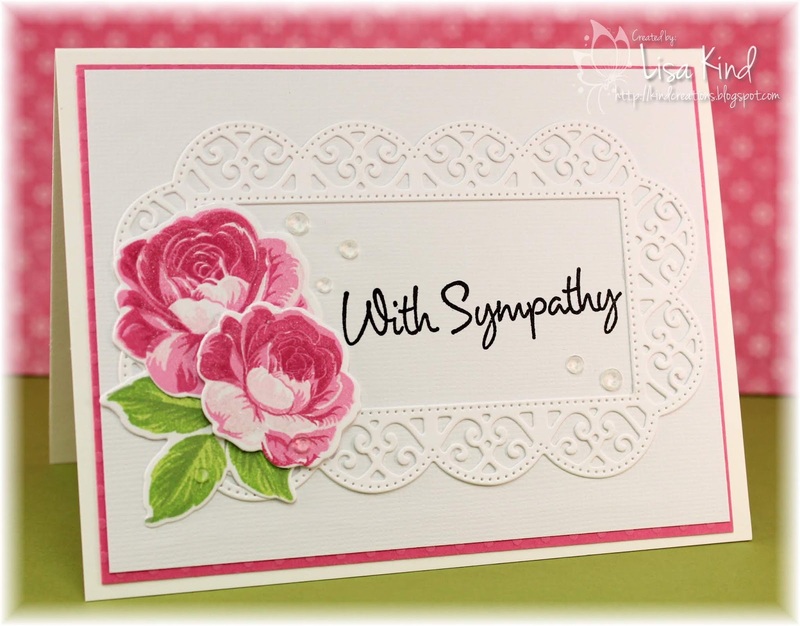 So I of course had to make a sympathy card for her and her hubby. They are so sad about this event. I thought this card may brighten their spirits a bit, or just let them know how sorry we are for their loss. 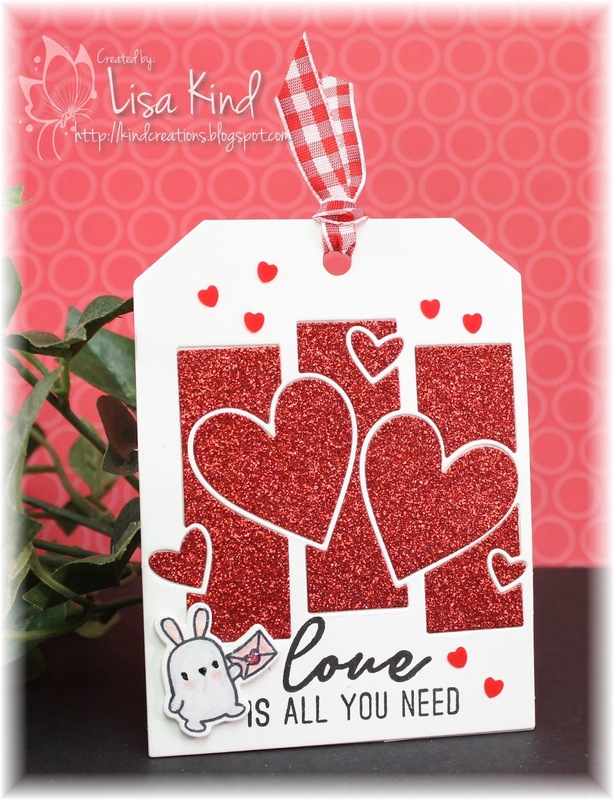 I started by stamping the sentiment and heart on one piece using Bristol cardstock (I actually wanted this to be on the inside, but it was the first card I made and now know what to stamp on which panel!). This was stamped on the longer die (if you take a look at the dies, you'll know what I mean). 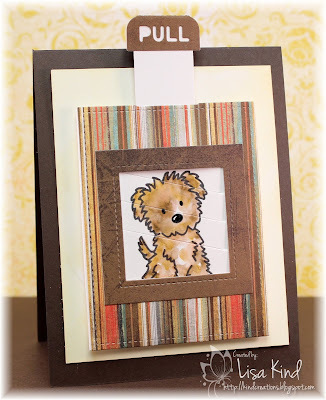 Then I stamped the pup on the smaller die on Bristol cardstock also. I colored the pup with two Zig markers. Roscoe is a mix of sort of brown, tan, and white colors. I tried to capture that as best I could. Next, I die cut the pieces and followed the directions on how to put it together (just go to Lawn Fawn's Youtube page to see a video). It's really easy to do. To decorate it, I used the Magic Picture Changer Add On dies and some pattern paper. I just love when you pull up the tab, the picture magically changes from the sentiment to the picture. My hubby even smiled when I told him to pull the tab! Making him smile about something like this is a SCORE! LOL! Thanks for stopping by! I hope you enjoyed this. I'll be posting another of these tomorrow so come back again! Hello everyone! 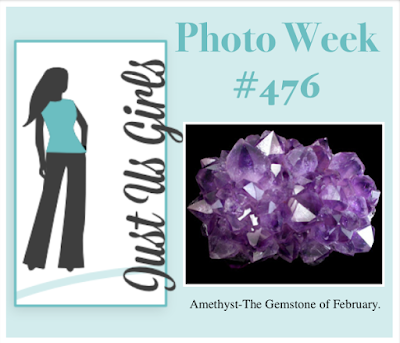 I'm the hostess over at Just Us Girls for this week's Photo Week challenge. I chose this photo of amethyst, which is the gemstone of February. 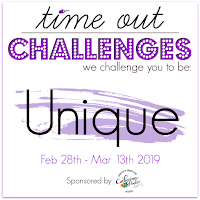 This is our last challenge for February. March and hopefully spring are on their way! I went to a class at our local stamp store, Buffalo Stamps & Stuff, a couple of weeks ago with my friend Cheryl and we made these beautiful cards. When I saw this purple one, I knew it would be perfect for this challenge. We used the Sunny Studios Everything's Rosy layering stamp set. 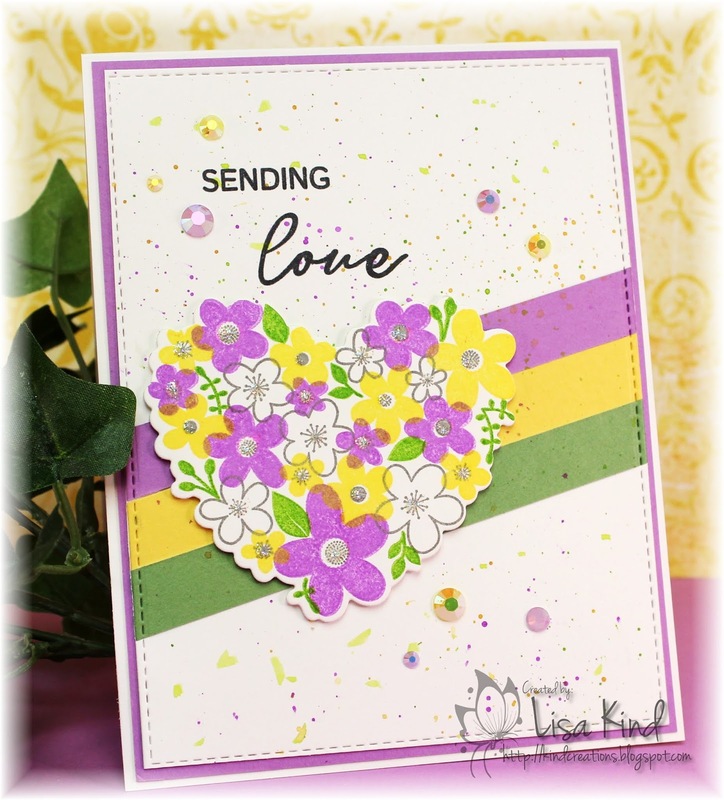 These aren't my designs...I only stamped and put them together. All the materials were provided, so I don't know what dies, papers, and such were used. But aren't these flowers and leaves so pretty? This one definitely was a favorite among the students in the class! This one was a tough one to line up because the yellows were so pale, but I loved them nonetheless. The lacy panel is not a die cut but rather a laser cut piece that the owner of the store purchased. Not sure of its origin either. I love the pinks we used on these flowers. 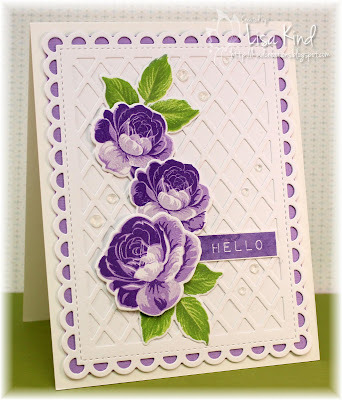 This is such a lovely stamp set! You can see more from the JUGs design team and our February guest, Lisa Elton, on the JUGs blog. This is her last week with us and she did a fab job with all of her entries! Thanks Lisa! Hi all! I watched a GinaK for Simon Says Stamp video yesterday and was wowed! 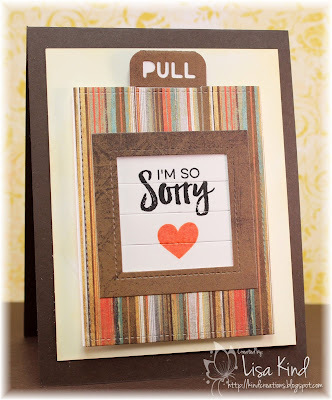 Gina took one of the Memory Box square frame dies and paired it with her Wreath Builder sets. It was very cool. Here's the link to the video. I cased her design, but changed up the set I used. 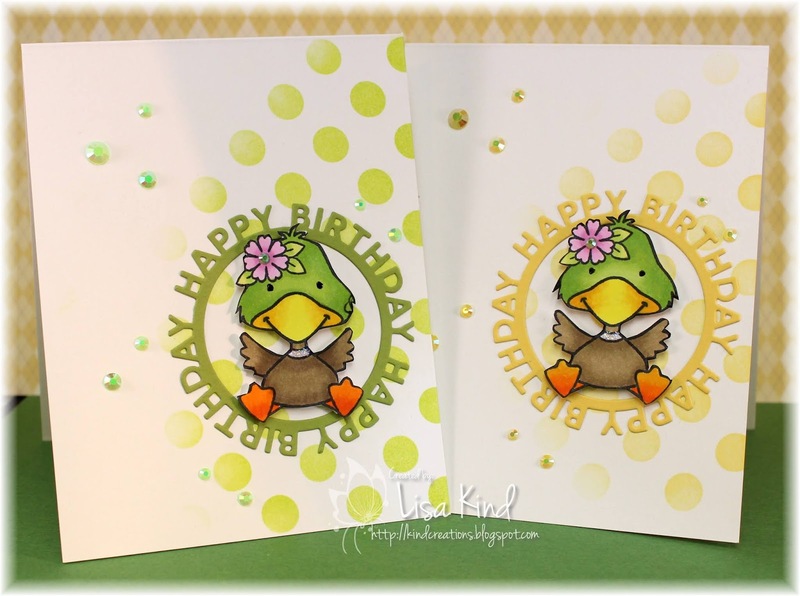 She created a square card then another to fit an A2 size card. That is the one I did here. 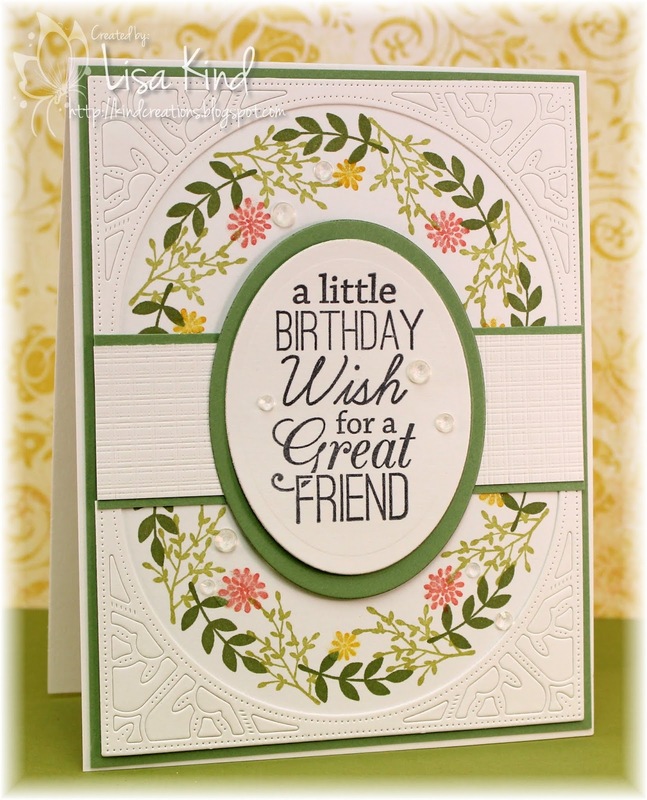 The Memory Box die is a 4x4 size which is perfect for the Wreath builder stencil. I die cut the MB die out of thicker paper and kept the pieces intact. I adhered a slightly smaller piece of thinner white cardstock behind it to keep it in place, but also to give me a place to stamp the wreath. Once I was done with stamping the wreath, I cut the piece in half. Those two pieces were adhered to a mat of green cardstock. This created an oval shape. 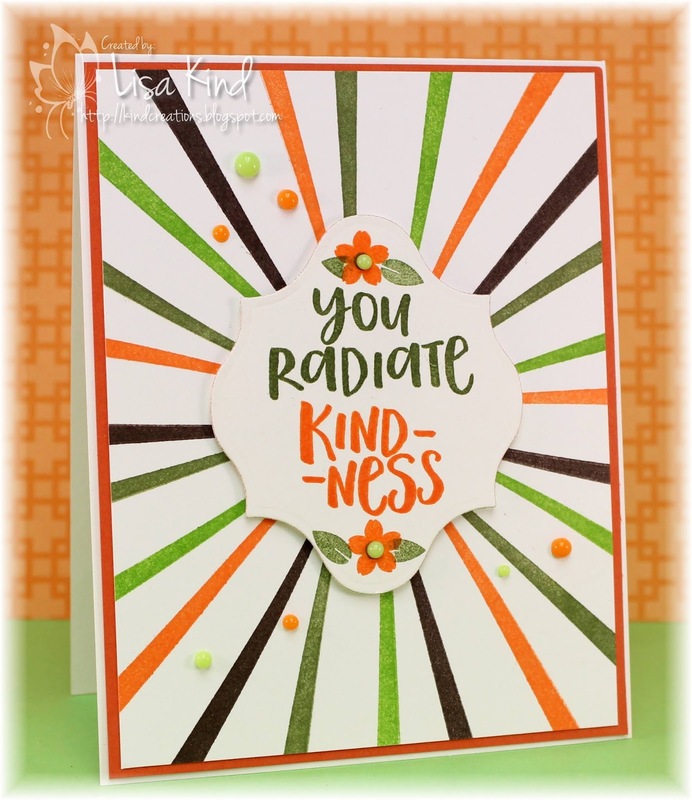 I adhered a piece of green and white cardstock to cover up the space in between the two pieces I cut then added the sentiment in an oval die cut. There is some shimmer on the flowers and some crystals added as well. I thought it was such a clever idea that I had to recreate her card! I'm linking this to the Seize the Birthday challenge. It's an Anything Goes challenge. Happy Sunday! 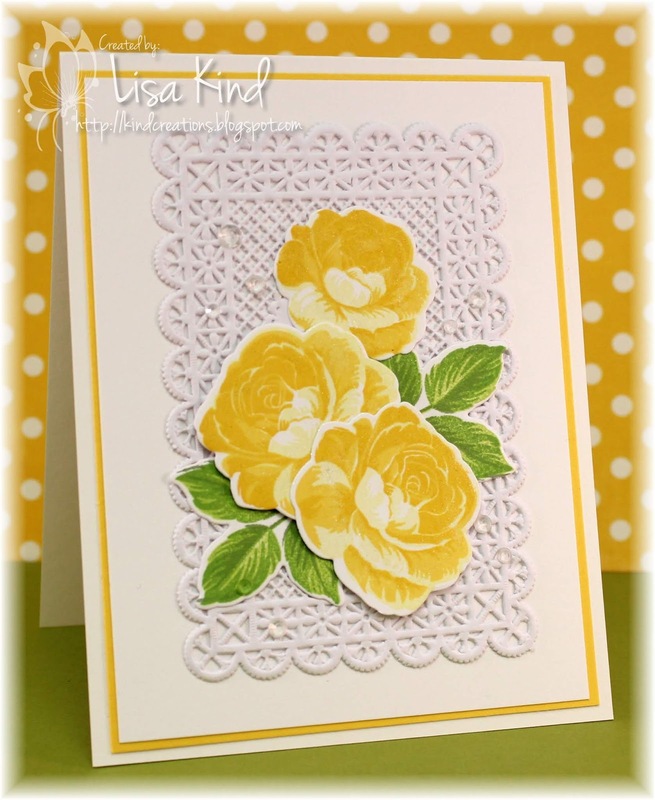 I've had a busy weekend, but I managed to eek out this card. I saw the Inspired By challenge and thought I'd give it a go. I've had this set from Right At Home for quite some time and had to break it out for this challenge. I wanted to do something different for the pots. I did the "kissing" technique. I inked up the pot then "kissed" it to an older basketweave stamp from Flourishes. It left this pretty pattern on the pot. These were die cut and popped up on dimensionals. That panel was sponged with antique linen ink before the flowers and cactus were stamped onto it. 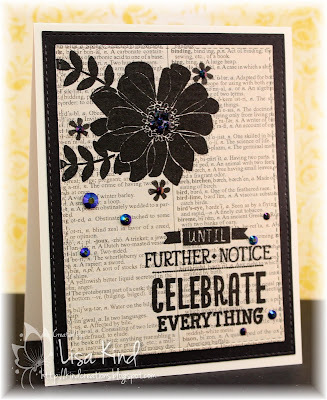 The sentiment was stamped, die cut and popped on dimensionals too. There is some shimmer on the flowers and cactus. 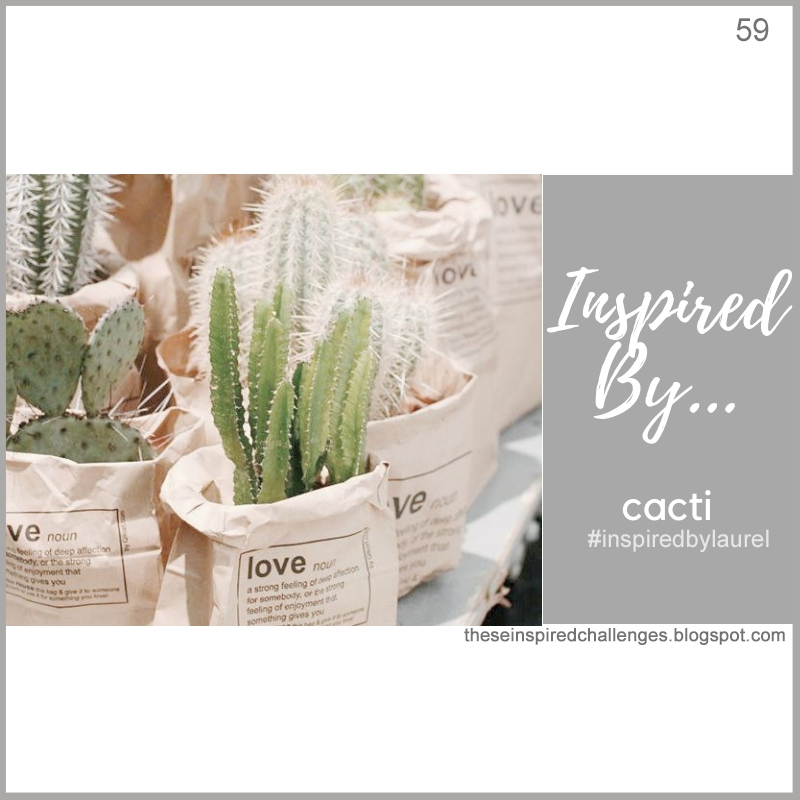 Here's the link to the Inspired By challenge and the photo I was inspired by. Hi friends! 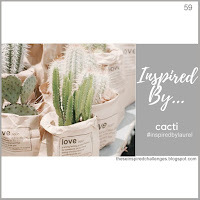 I had some things going on (Valentine's Day celebrations with friends) this weekend and had trouble getting this blog done! But the card was done, so that's all that matters, I guess! 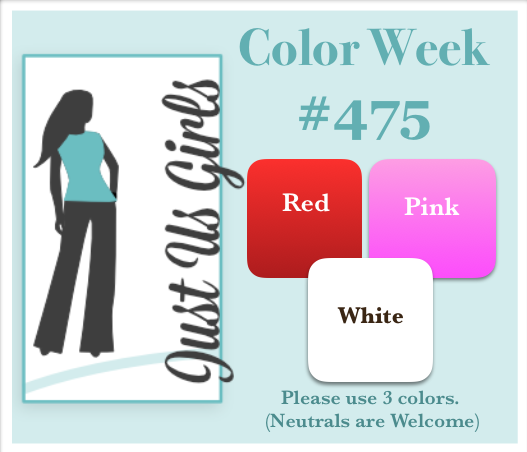 Maria chose a pretty and timely color palette for our Color Week at Just Us Girls! I was done making Valentine cards, and I've been trying to keep up with my sympathy card making. Seems I always need these. I just sent out three. :-( This pretty die from Memory Box was die cut from white cardstock, then I just put some scraps of white cardstock to die cut the heart again. I colored them with red copic markers and stacked them back into the die. I chose some pretty pink gingham paper to put behind it. 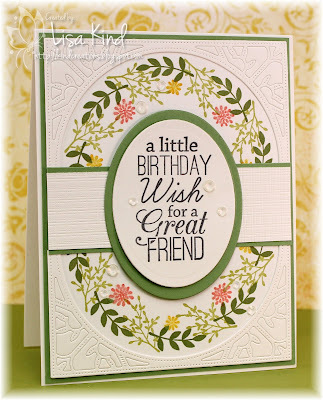 The sentiment was die cut three times from white and stacked as well. The stamped sentiment was stamped in a dark gray ink. I added some shimmer on the heart and sentiment and some crystals to finish it off. This is a square 4.25 x 4.25 card. 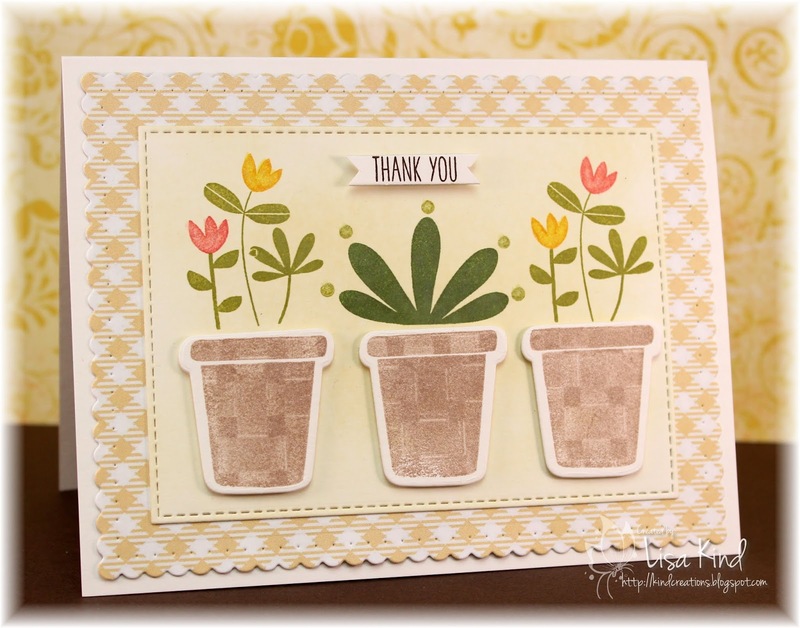 You can see more from our JUGs design team and our February guest on the JUGs blog. Happy Valentine's Day everyone! 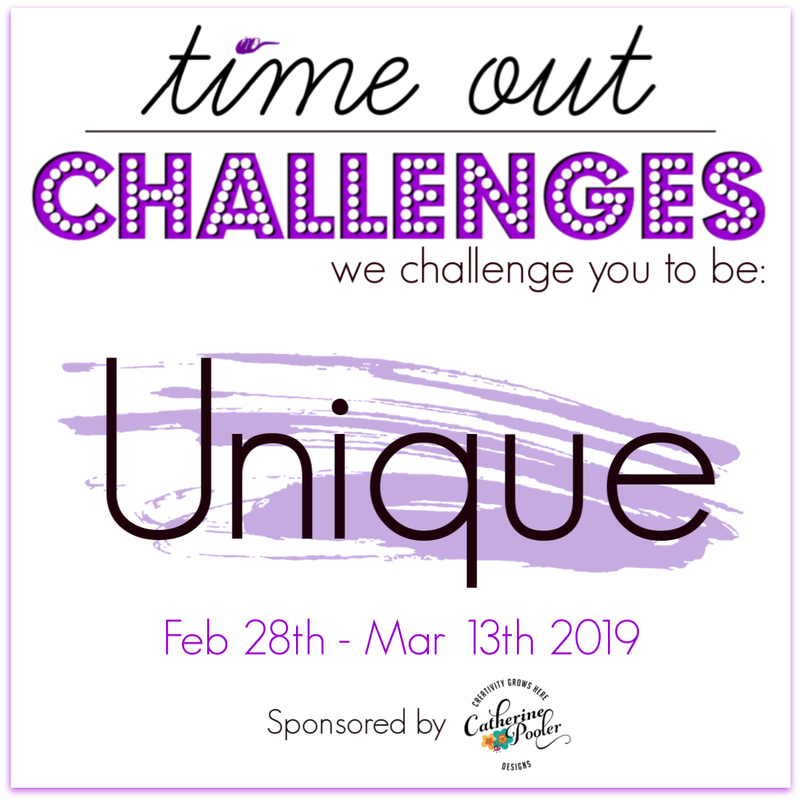 It's time for another Time Out challenge (but I don't have a Valentine card for you today!). 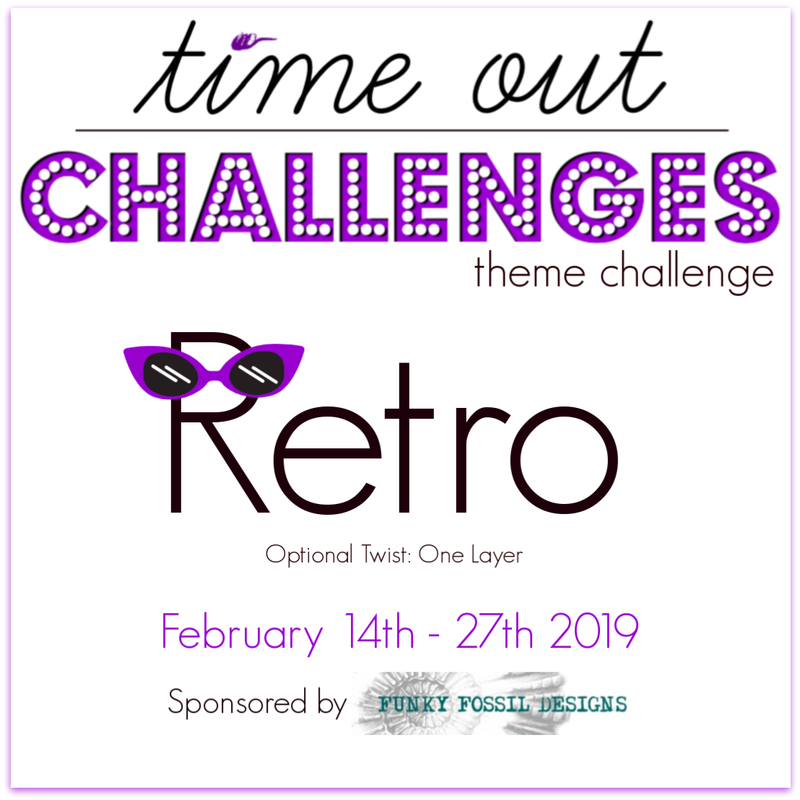 This is our theme challenge, and we want you to go RETRO! How fun is that? So I went with retro colors...remember those from the 70s? Orange, green, and brown? I also thought these rays looked retro-ish! 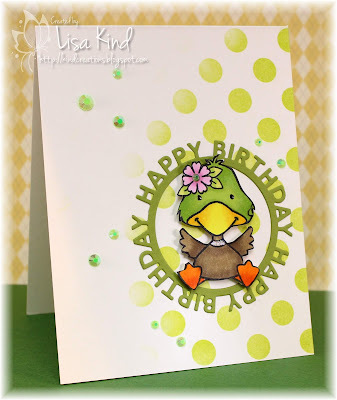 I stamped this turnabout stamp in those colors and used the sentiment in the set in the green and orange colors. I added the flowers...they looked retro to me as well! 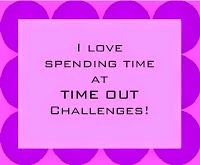 You can see more from our Time Out designers and our guest for this challenge, Esther, on the Time Out blog. Hey friends! I'm back with another entry for the 30 Day Coloring Challenge. Getting my coloring on and having fun doing it! Here are the two images I colored. They were very quick coloring too! 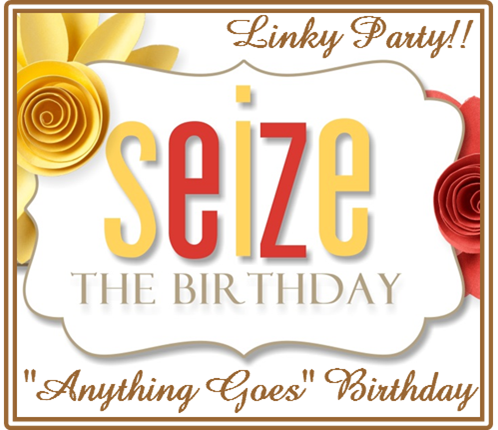 This was the first of the two I created with the image. (The image is from Darcie's; no name on it just a number, but it has two duck images and cute sentiments. I'll have other cards made with the other image soon.) I pulled out a circle stencil, yellow ink, and those life changing brushes that are all the rage. They really are so soft and easy to use! 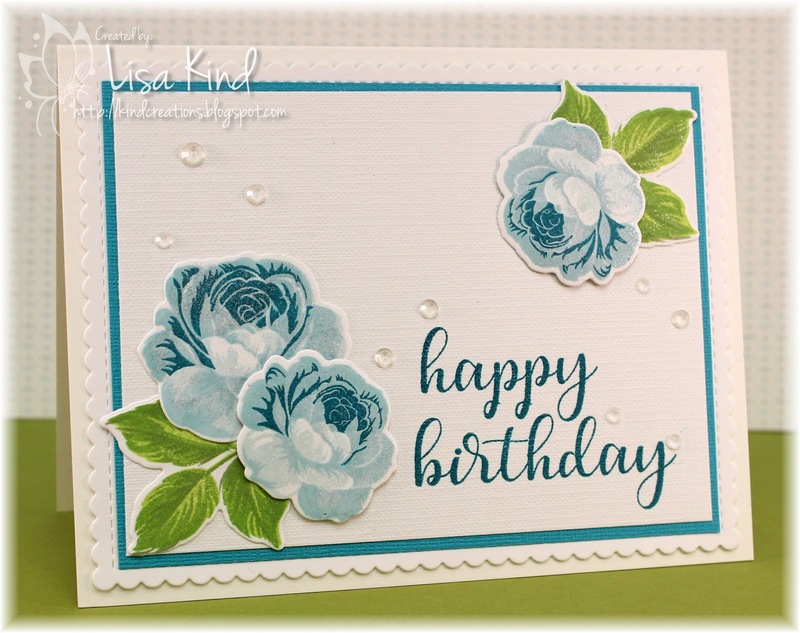 I wish I would have stenciled out more, but I did that on the next card. 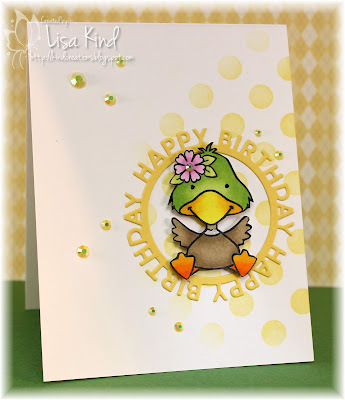 I die cut the circular HB die and put the image on dimensionals right in the middle. I added crystals to the card and on the center of her flower. I also added some star dust stickles to her color. This is (shockingly) a one layer card (sort of!). 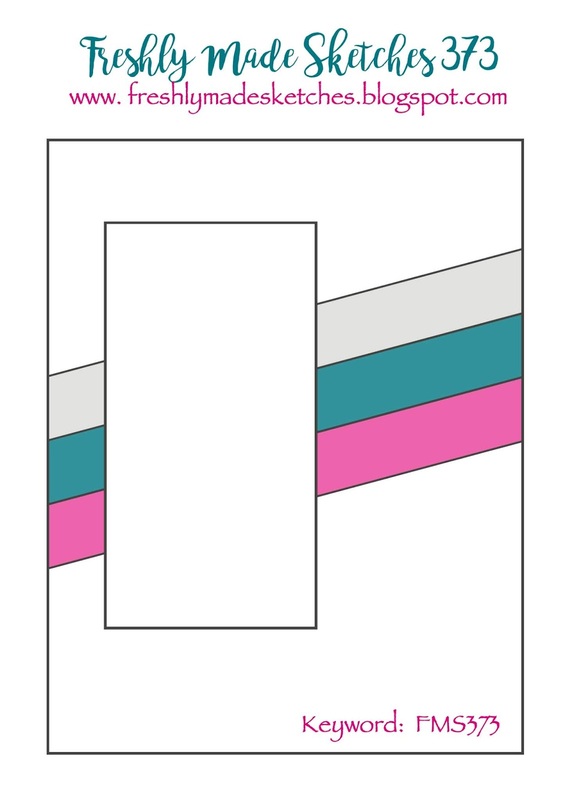 I did the same with this card, but just changed out the colors. I stenciled out more of the green on the card and I like it better. Hello there! 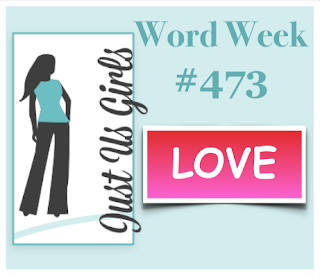 There's a new challenge over at Just Us Girls. 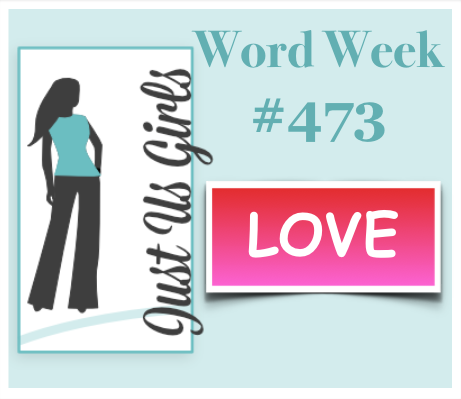 It's Word Week and Ina chose LOVE. Perfect for this time of year (or any time of year for that matter). 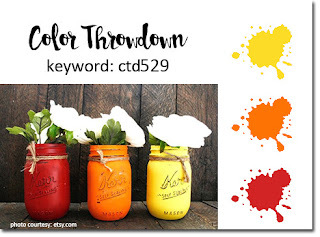 I don't know why I chose these colors (after seeing everyone else's cards for this challenge in pinks and reds! 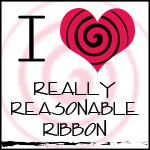 ), but I love them (no pun intended!). There are four stamps to this image, and each one was stamped in a different color. I didn't like all that stark white in the background, so I spattered some of the colors I used on the image. Not sure how I feel about it afterward, but it's done! 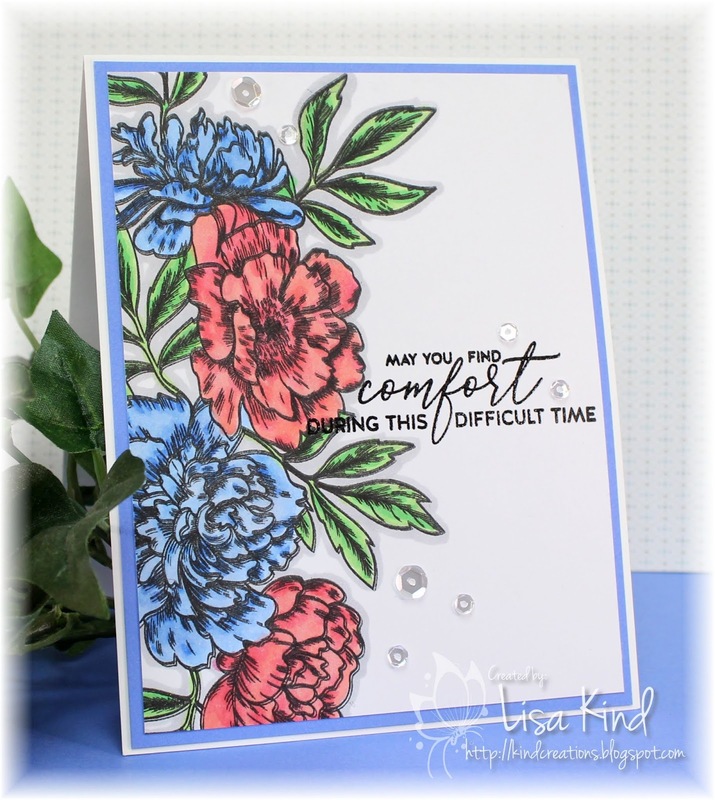 I added star dust stickles to the centers of the flowers and crystals to the panel. 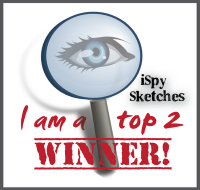 I'm joining Freshly Made Sketches with this cool sketch. You can see more from our JUGs design team and our new guest for February, Lisa Elton, on the JUGs blog. I was so happy to see that the Tag You're It! Challenge is back! 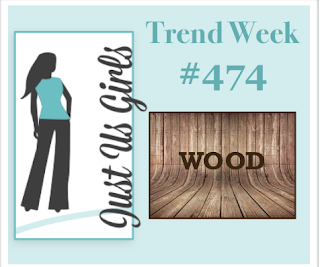 I love making tags. I don't use them much, but I love making them! 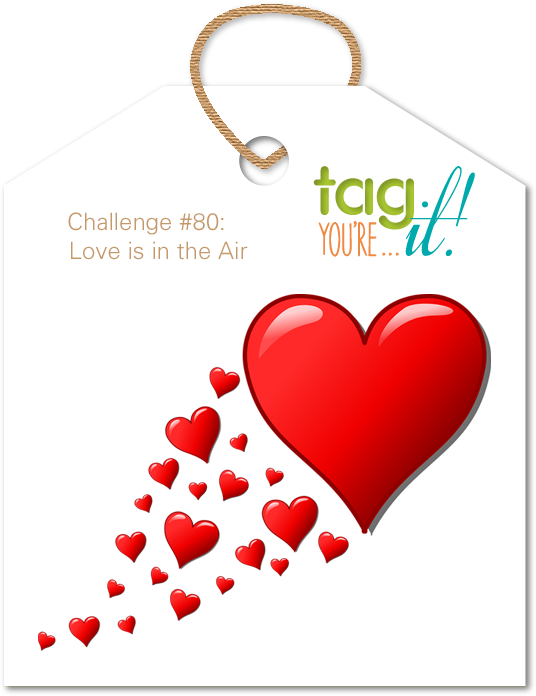 Their theme is love is in the air, and when I saw their graphic, I thought of this die I have. I first die cut two tags from white card stock. 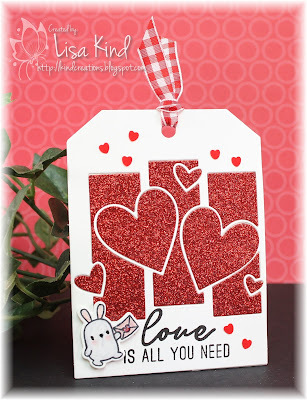 Then I die cut the heart die from one of them and again from red glitter cardstock. I covered the one tag with adhesive and adhered the other to it. Then I just inlaid the red glitter pieces into it. I stamped the sentiment in black ink. I decided it needed something. I saw these little agenda bunnies stamps and chose this one. I did color him with copics (it's not much, but I did color him with pink, red, and gray markers), so I'm entering this into the 30 Day Coloring Challenge. You have to start somewhere, right? I do want to color more, so baby steps! I added ribbon and these little hearts to finish it off. 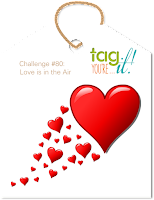 Here's the link to the Tag You're It! challenge. And here's the link to the 30 Day Coloring Challenge.